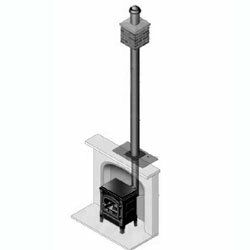 For any wood burning or multi fuel stove to work successfully, it must be connected to a sound chimney and correctly sized flue. 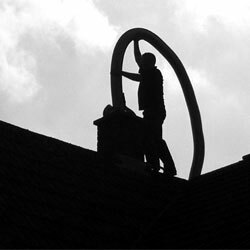 Since the mid 1960’s, a chimney liner has been required by the Building Regulations in England and Wales and chimneys built before this will probably have no lining. 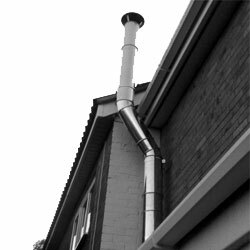 If your property has an existing chimney, this can be lined with a flexible flue lining system. If you don't have a chimney, we can create one for you. The simplest, most cost effective solution is to install an insulated twin wall chimney system, (subject to survey). Twin wall insulated flue pipe is a double skinned flue that is approved by HETAS and is suitable for constructing internal and external flue systems for wood burning stoves, multifuel stoves, gas and high temperature oil stoves. Twinwall can be installed either internally, rising up through the building and out of the roof, or it can pass through the external wall and be secured to the outside. 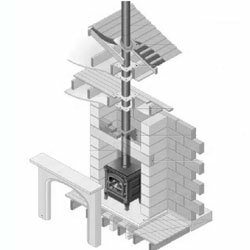 A false chimney breast can be constructed to conceal some of the flue pipe if you would rather not see too much of it internally. 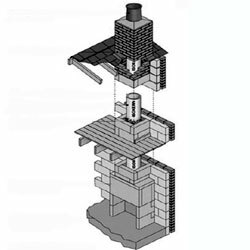 Alternatively, a new traditional brick chimney stack can be built lined with either clay or pumice liners. 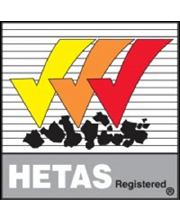 New installations must be approved by Building Regulations, but because Chimserv is a HETAS registered company, this will automatically be taken care of for you, thus saving you time and money.